Alberta motorcyclist Wayne Hamm is taking his 77-year-old stepfather, Bruce Wheeler, on a month-long ride from the Pacific Ocean to the Atlantic. There was more than just a little excitement in the air when we arrived at the Rover staging area between Nelson and Castlegar, B.C., on June 22, 2012. Close to 60 riders showed up for this year’s Summer Solstice Ride. The Timber Trails ATV Club in Big River, Saskatchewan, kicked off their riding season with a spring rally on May 12, 2012. Beverley Kaltenbruger from Lethbridge, Alberta, shares the story of her first ride on a dirt bike and how it established a lifelong passion for the open road. From bush roads and backcountry trails to paddling routes and fishing spots, no stone is left unturned in the new Northern BC Backroad Mapbook (3rd Edition). Available in three different styles, the No Drag Mach series of backpacks are designed to prevent wind drag and enhance motorcycle riding performance. The first round of the Royal Distributing/WEC Canadian Off Road Championship kicked off in Vernon, B.C. Shane Cuthbertson, 36, has been a strong contender in off-road dirt bike racing for more than 20 years. It’s not a one-or-the-other-kind of thing. It’s not down with the greenies because I dig two-stroke smoke. The old stereotype of the irresponsible powersports fanatic is now replaced by people who are simply out to enjoy life. There's just one more race to run to complete the Vancouver Island Motocross Championship Series. 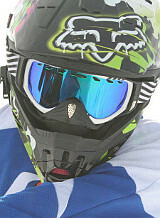 Whether you are riding a dirt bike, ATV or UTV—your sense of sight, hearing, touch and smell are important allies when it comes to understanding your unit.